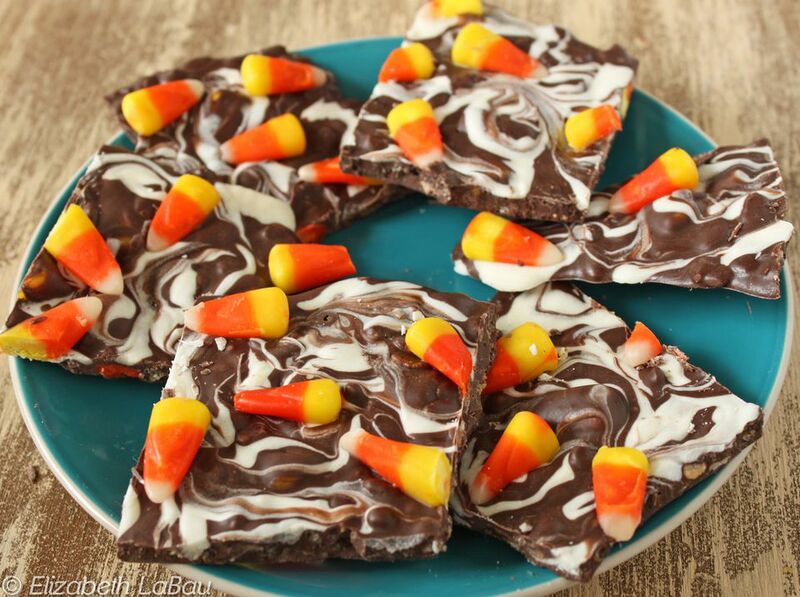 This colorful bark features the best of two Halloween favorites: candy corn and chocolate! It's crunchy, chewy, festive and—not surprisingly—quite sugary, so it's perfect for candy corn lovers and revelers with a strong sweet tooth. Prepare a cookie sheet by lining it with aluminum foil. In separate bowls, melt the chocolates in the microwave or over a double boiler. Add half of the candy corn and all of the crispy rice cereal to the melted semi-sweet chocolate and pour the chocolate onto the baking sheet. Using a spoon or spatula, smooth the chocolate out in an even layer. It does not have to cover the whole pan. Take a spoon and drizzle small amounts of white chocolate over the dark chocolate in a random pattern. Use a toothpick or the tip of a knife to swirl the two chocolates together. Don’t overswirl and muddy the colors—you should still be able to see the distinct chocolate colors in the end. Scatter the remaining 1/2 cup candy corn over the wet chocolates, sprinkling randomly and pressing them gently into the chocolate until they adhere. Put the chocolate in the refrigerator for 30 minutes to harden. When the bark is firm, remove it from the foil, and break or cut it into small pieces. Store the bark in an airtight container in the refrigerator for up to a month, and bring it to room temperature before serving.